Heat 1 tablespoon oil in a large heavy skillet over medium heat. Add chicken and season with 1 teaspoon garam masala and cayenne. Cook until lightly browned, about 10 minutes. Meanwhile, prepare the sauce by heating 1 tablespoon oil in a large saucepan over medium high heat. Saute onion until soft and translucent. Stir in butter, lemon juice, ginger, garlic, garam masala, chili powder, cumin and bay leaf. Cook, stirring for 1 minute. Add tomato puree and cook for 2 minutes, stirring frequently. Stir in cream or half-and-half, yogurt and cilantro. Reduce heat to low, and add the browned chicken. Simmer for 10 minutes, stirring frequently. Season with salt and pepper to taste. Just before serving, add the ground cashews and stir. Serve over steamed basmati rice. I love the colour of this dish...it looks fantastic. Ahhh. 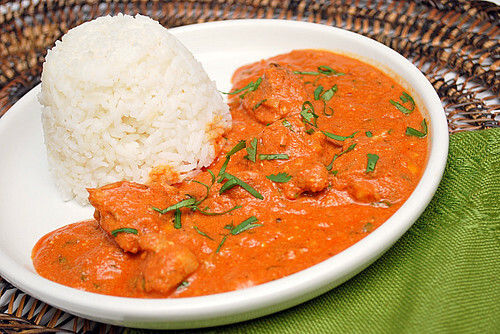 Butter chicken. One of our favorites. The best recipe I've found so far belongs to Madhur Jaffrey -- and it makes use of leftover tandoori chicken. Since I don't always have leftover tandoori chicken on hand, I just might give this a try! Thanks for sharing. It looks wonderful, and I can't believe how easy the recipe sounds. Can't wait to try! DELICIOUS! Indian is my FAVORITE cuisine! This looks absolutely awesome! why does it say one cup of cream and in the method its does not mention cream? Anonymous - thanks for your question! You can use either heavy cream or half & half in this recipe. I've updated the directions & ingredient to clarify. Hope this helps! Did you use canned tomato puree or fresh tomato puree? I dont want to use cream or half and half, that's just too fattening. Got any healthier options? and reporting! Keep up the excellent works guys I've added you guys to blogroll. This was unbelievably delicious, as well as being fast and easy to make. Easily the best butter chicken recipe I've tried. Thank you so much for sharing! So excited to try this!! Sounds like a wonderful recipe! Will leave the cashews out though! Thanks for sharing!